When I first started blogging in 2007 (with a lapse in 2008), to say I was a novice would make me sound like I had a clue about what I was doing, I didn’t. Once I began to post in earnest in early 2009 I noticed there were sites being nominated for various awards. I figured that since only 2 of my close friends, and my mom, read my blog the chances were slim and none that I would ever be noticed. 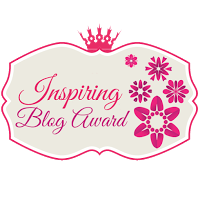 So it was a huge surprise and a compliment for me to be nominated for a Liebster Blog award. In addition, the person nominating me was a new blog friend, Christina at Floriday’s Mom. I think Christina explains the award best, “It’s basically an opportunity for bloggers to share a little love to other up and coming bloggers”. So for that, I thank you. 1. I’m a redhead. When I was young I hated the attention that got me, but I’m okay with it now. 2. I can’t really start the morning without a cup o’ joe. I don’t drink coffee all day, but I confess, I must have a little caffeine kick-start first thing in the morning. 3. I love most music but my radio station in the car is set for classical music. I love Mozart. 4. I share a birthday with Mozart. (see above). 6. I’m an only child. I always wanted a sister or brother. One of my closest friend’s is like a sister to me, does that count? 7. I used to have a gardening business with a good friend, Blooming Borders. We planted predominantly English gardens for 13 years. 8. I love Mexican food. Enchiladas, tacos or burritos, I could eat the food daily. 9. I usually have a hard cover book going but I love listening to unabridged books on my iPod. It allows me to multitask. 10. I love college football, in part because it signals the beginning of fall and its seasonal goodness. 1. What’s the number one on your Christmas List: The number one person is my husband (to buy for) the number 1 wish on my Christmas List is a pair of riding boots. 3. How did you come up with the name of your blog? Son #1 came up with the name and set me up…this was in 2007. He later said he thought the name was too long but I told him I wanted to keep it. 4. What is your secret indulgence? I’m a salt fiend and Lay’s Potato Chips and/or a great order of fries are the indulgence. I know how terrible those two items can be in fat, salt and calories, so when I do indulge, I feel just a little guilty. 5. Which of the four seasons do you look forward to the most? Fall, although spring is a close second. 6. What’s your biggest pet peeve? Grumpy, unpleasant people. I believe happiness is a choice. 7. What is your favorite décor? Traditional with a leaning towards English and French country. 8. What did you want to be when you grew up? This is pretty revealing…I wanted to be an airline hostess. In fact when I went to the local junior college there was a program for that. I later decided I wanted to teach. Instead, I got married and worked for a real estate developer until I had our first son. I was hired as a teacher aide for several years, now I’m back to Real Estate Development. 9. Who makes you laugh the most and why? Besides Jon Stewart, my husband. 10. Name one thing on your bucket list. Touring Germany. My father’s family was from Germany and I’d love to visit one day. 4. Are you a do-it-yourself person or do you keep a list of handy people near the phone? 5. Are you a city person or a country person, why? 7. Do you prefer old/antiques or new furnishings? 8. Do you lean more towards a tailored look or ruffles and lace? 9. Which would you choose, the beach or the mountains. 10. What’s one modern convenience you couldn’t live without? 11. What’s your idea of the ideal evening? This was fun. I hope you’ll visit the 4 nominees and thank you, as always for stopping by for a chat, I love your comments! From one long-named-blogger to another, I love this post! Maybe I will just copy and paste yours instead of writing my own! You really did a beautiful job… it’s by far my favorite awards-related post. Although, it’s possible because A-I like you so much already. And B- I too am a Mexican-food-loving, salt-addict. Also I really like ketchup. I put salt IN my ketchup as well as on the fries. I will work on an acceptance post after the holidays are over. I really like yours and think I could rock my own…It’s surprisingly fun reading random things about people you already enjoy! p.s.-My biggest pet-peeve is when people stand too close to me in line. This makes me crazy! Like, hello! I am already here occupying this space!! I knew we could have a blast at lunch. Do you have a good Mexican restaurant near you? We have a few but are always searching for that perfect hole in the wall where the tacos are authentic and the salsa is fabulous! Congratulations, dear Karen! Your blog is one of my favourites and I always look forward to your posts. And today’s is such a fun post. Loved reading all these things about you. Blooming Borders? What a beautiful name for your gardening business, did you come up with it? Ps: thanks for the mention in your previous post! Have to catch up with all the posts I’ve missed! Karen, I loved this interview! Wow! 40 years of marriage 🙂 We celebrated our 30th in July (I always say I was a child bride too) . I’m a fan of English and French decor and always crave Mexican food. Washington state does not make Mexican food like California! I’ll look forward to checking out the other blogs! I know my friend on Bainbridge Island complains about the lack of Mexican food in your area, she’s a California girl too. Congratulations, Karen! I think it’s wonderful that you were nominated for a Leibster Blog Award. I’ve loved reading your blog since I first knew about it. The pictures and the text are always uplifting and inspirational. Reading your responses to the questions was fun. Although I knew most of the answers already, there were a few surprises – I never knew you and Wolfgang shared the same b-day! Again, dear friend, sincerest congratulations. You deserve the accolades. Thanks, Linda. I was flattered and touched that a new reader nominated me. I had fun answering the questions. Karen, the first thing that popped into my head after reading about your nomination was how proud Kyle must be. Do you think he knows how influential you’ve become with your blog? I look forward to your postings each week and always find them creative and inspiring. I also enjoy reading the comments by your numerous followers. Congratulations, my friend, you are so deserving of this honor! Congrats, Karen! Aha! Now I know why your garden is so fabulous…..you were in the gardening biz 🙂 Enjoyed learning more about you. And many congratulations on 40 years with your husband in February. Thank you for your kind words. Since returning to work full time my garden has complained with overgrowth abandon. I am working on taming it once more and with winter on the horizon, I hope after a good rest, it will be ready to perform again next spring! 🙂 I’m am inspired by your lovely garden and a few others in blog land. Karen, thank you for taking the time to do this (I know..it took me 3 nights to wrap mine up) It was so great getting to know more about you. WOW…40 years, that is amazing and really something to celebrate, congratulations!!! I stared that at steaming cup of coffee for several minutes..hahaha. It made me want to make a cup of decaf to sip on tonight. So happy to have found you and your blog…I so enjoy your site. Thank you, for nominating me. Yeah, 40 years sounds like a long time, even to me! Truth is, it seems to speed by. Especially when I read blogs like yours it seems like yesterday that our two son’s were your little guy’s age. boy, we have a lot in common…including having our very own Mr. B!